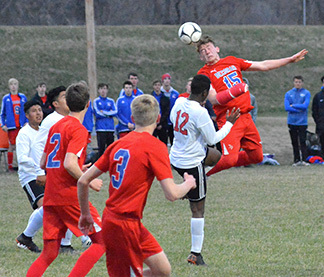 The Decorah boys’ soccer team (2-3) took down Independence (2-2) Monday night, 3-1, with goals scored by three different athletes. “The guys finally had the game they’ve been building towards,” said Coach Ben Shockey. The first goal of the match came at the 27:00 mark from Bryce Bockman, on a Galen Iverson assist to leave the Vikes leading 1-0 at half. Willem Hawley scored the second goal for Decorah at the 62:00 mark and Sawyer Vanden Brink tallied the third goal for the Vikes on an assist from Thomas Hadley. Independence’s lone goal came late in the second half. “The guys did what we asked of them at halftime: they knocked in a couple of goals, kept the intensity high and stayed solid on defense,” said Coach Julie Shockey Trytten. Juniors Owen Bruening, Mitchell Leschensky and Joseph Seo along with first-time starter, freshman Brody Young drove the Viking defense. “A well-executed team defense led to our 3-1 win over a dangerously fast Independence team,” said Coach B. Shockey. The junior varsity squad hosted Cedar Falls coming out on top 2-0, Monday night. Junior Jose Pastor scored the first goal for the Viking squad with freshman Trysten Finholt knocked in the second. A solid defense led by freshmen Drew White and Drew Berns combined with goalkeeper Brayden Reiser to secure the shutout. “It was a fun night of soccer with three wins for Decorah. Hearing of our JV team winning at home, then watching the girls seal the win in overtime at Independence, and then getting the entire squad in for the win on varsity... what a night.” said Coach J. Shockey Trytten. Friday, April 12, the Vikes are slated to get on the pitch at West Delaware at 4:30 p.m.